Most people would buy raincoats not realizing that it is only rain resistant or a piece of clothing that can only be used when it is raining. November Rain found a way to make it a fashionable statement piece that anyone can use anywhere. They gave us a stylish rain poncho that gives a waterproof covering at the same time allowing you to carry on your normal activities. 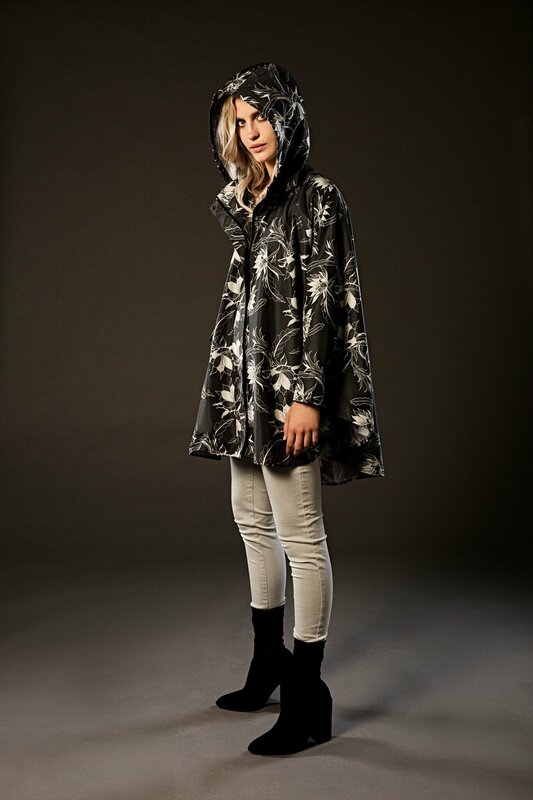 Their ponchos are printed using ecologically sound water less printing methods and quality crafted with heat sealed seams proven to withstand any weather. 1. What inspired you to create November Rain? I was funding freshwater initiatives in developing countries such as Malawi (Africa) and Asia, and the concept behind November Rain was to be able to support these projects. Often a brand tacks on a Giving Back program as an afterthought for marketing purposes, but this is different. I launched my other brand in 2004 and grew it into a multi-million dollar business, but never really gave back from the heart. When I created November Rain, I made our Giving Back program a priority. It means a lot to me. November Rain ponchos are printed with eco-friendly dyes and printed using a waterless printing method. Sustainability goes hand in hand with our mission of Giving Back. November Rain is all about combining lifestyle, design, and functionality. With 10% of all revenue going towards water projects in developing countries, November Rain is all about doing good; whether it's providing clean water to those in need, or protecting our waterways from disposable plastics. 3. What is your favorite November Rain product and why? Rain ponchos of course! But then again, I love the reusable bag we have just brought out and I am super excited about the new products we have on our drawing board. All in the name of sustainability! Sunscreen and water. No seriously, apart from the fact I live in Australia where it is incredibly hot and sunny, it is so important to protect our largest organ. I use a natural sunscreen Eco by Sonya which it is free of oxybenzone, which is a harmful chemical. My purse will always hold a lip balm - again I use Glory Lips (Eco by Sonya), Rosewater Facial Spray (Mario Badescu), and hand cream - I have so many lying around, but my fave is L’Occitane Shea Butter. Being Kind. Unkind girls are not pretty, no matter how much makeup they wear. Beauty really is from the inside. The morning I start off with a foaming cleanser; I have just started using a brightening one - although it is only day 3 so I haven't really seen the results yet. Then I add an antioxidant serum and finish off with a moisturizer with SPF 30. Evenings I use a foam cleanser again, but I do swap out an exfoliating cleanser every few days. If I'm wearing make-up I will use a toner at this stage. I use a night cream with added retinol and also eye cream. I'm a mature woman with skin that seems to think south is a good direction. If I could tell a younger me anything, it would be to look after your skin. Both from the inside and out. People often think of their skin as some kind of shell that keeps all the bones and muscle intact. But it's not. It's our biggest organ and how it looks and feels is often a reflection of how we are treating our bodies. 8. What's next for November Rain? Expand the range of products (they will still look great!) and give more people in Africa access the fresh water.